1 week since first run of the magical castle. 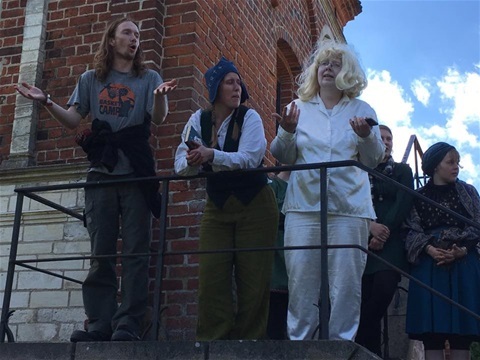 I know it has been a long time since I wrote anything, but I have been busy trying to help my little sister creating a big scout event for almost 100 scouts here in Denmark, plus talking with the organicers of the magical castle BROGG LARP event which we held just about a week ago. And I gotta say that I still get tears in my eyes when Im thinking back on that event, since we had 60 kids runing around in a magical universe, smiling and having fun. I did not personly participate in the LARP. since I was in the gamemaster bunker trying to create enough plots and happenings for the players and staff, so that they were entertained most of the time. But hearing these kids laughter and seing through the window how they smiled and having fun, just gave me the energy that I needed to continue going on. Lucky enough for me I had a mentor who could help me, making sure that I also got the basic needs for my self like food, was a big thing. Because when you are thinking about somethjing and you get hyped. well you tend to forget something about yourself. So thank you Kaare for helping out, and just junping in every time that we needed help in organicing even the smallest things, to make this event run smoothly. A big thx to the staff and npc´s for comming, without you we could not have done this at all. I only got the feeling about how the games was going on, when you came and told me something. And it made me happy all the time, or most of the time.... Because when you are trying to get a nap, and you wake up after 45 minutes and are being told, ohh yer by the way, the first year students have summoned a imp, and let it run around in the school yard.... and where I then just thought okay my day cant get worse then that, when you then are being told that ohh yer btw 4 students have been bitten by a werewolf.... that can be a bit frustating.... But not in a bad way, since that made me realice how much that was going on, and it looked like the childrens had fun by douing such kinds of things... So noo you did not made my life easy, but you did what you have to do to entertain the childrens, so that they could have an amacing time, which for me was the most important thing! But also a big thx to all of the childrens for comming to our event, a lots of you had never played LARP before, and some of you had also never tied to sleep so far away without your parrents in a tent before, which Im suprised, that you just had said to yourself, that you wanted to try this event, and it did not matter if you had to take a journey on more then 100 kilometers without your parrents, to a place you have never been to before, being together with other people you had never meet. And still being able to having a great time, I have been told by some of the other organicers, that they could not see or feel, if you had been playing LARP for 5+ years or never had tried it before. And talking with you after the event, where you just said that you did not want to leave before we created such a event again, or telling me that this event was much better then Fastaval(huge LARP Congress here in Denmark), some of you even came and hugged me to say thanks for creating this event, even though you had not seen me most of the time, since I was behind the scenes. It is such things like that which makes me love creating LARP events, and that I want to create more events in the future. I cant promise yet if we are creating another magical castle yet, because we have a lot of things to consider. Like Im moving to Canada this October, and Eva moving to Haderslev in Souht Jutland here in Denmark later this summer, which means that there is a chance that we would not be able to atend the next magical castle, which means that we have to find other peoples, who can run it for us. But I do hope that we can do it again some times in the near future. But I wil ofc keep you updated about what we desides to do.